Spring cleaning time already? Or are you putting your house on the market? Regardless of the reason, you’re here because you’re want to know how to clean wallpaper. Once wildly popular in the 1980s, wallpaper is making a huge comeback. The wallcovering market brings in a whopping $1.7 billion each year and is growing. We can assure you that today’s trends certainly aren’t your grandmother’s wallpaper. In this article, we’ll dive into everything you need to know about cleaning wallpaper. Find out everything from what type you have to what products to use–and avoid. Grab your favorite sponge, we’re getting started! If you’ve gone wallpaper shopping, you may know there are many different types and styles of wallpaper, each with their own rules for care. If possible, consult the care instructions that should have come with the installation or packaging. If you do not have access to this information or weren’t so lucky to have chosen your wall covering then “stick” with us, and we’ll walk you through it step by step. In the interest of time, and your attention span, we’ll go over the two most common types of wallpaper. If you don’t think you have either of these types, click here to read up on the other types of wallcoverings. Traditional wallpaper is what you often think of when you think of wallpaper. It’s made of cellulose, a porous plant material, which allows it to be very breathable. It’s easy to apply, affordable, and accessible in most design stores. Traditional wallpaper is often used in bedrooms, living rooms, and hallways. Because the material is so porous, it does not take well to moisture, therefore, cleaning of traditional wallpaper with soap and water is not acceptable. Vinyl wallpaper is another very common type of home wallpaper, and for a good reason. Unlike traditional wallpaper, vinyl is resistant to light and moisture, however, it does come off artificial. Due to its durable and reliable nature, this type of wallpaper is often used in kitchens and bathrooms–the rooms with the most messes. You’ll see just how easy vinyl wallpaper it to clean. Now that we know what type of wallpaper we’re dealing with, we can find out exactly how to clean it. Cleaning wallpaper is more than just grabbing a wet tissue and scrubbing with all your might. Wallpaper is delicate and hard to replace if warped When cleaning, proceed with caution and follow our tips for success. The first step before cleaning your wallpaper is removing the layer of dirt and dust coating the wall. Most wallpaper has a texturize to it, which attracts dust particles. Grab your favorite duster or a dry cloth and wipe down the surface of your walls and baseboards. For vinyl wallpaper, use a solution of mild soap and water. Dip a sponge or a linen cloth into the solution and wring out throughout. Too much water is never a good thing. For traditional wallpaper, avoid using water, however, depending on the brand, you can get away with a very damp cloth on stained areas. If you cannot wipe off the stain with a gentle rubbing motion, then it’s best to leave it to avoid further damage. When washing the walls, use large sweeping strokes from bottom to top to not only protect the baseboard but avoid dirty water from running down the wall and creating unsightly streaks. Pay attention to the seems of the paper. Wash in the direction of the vertical seams but be sure that no water seeps beneath it. 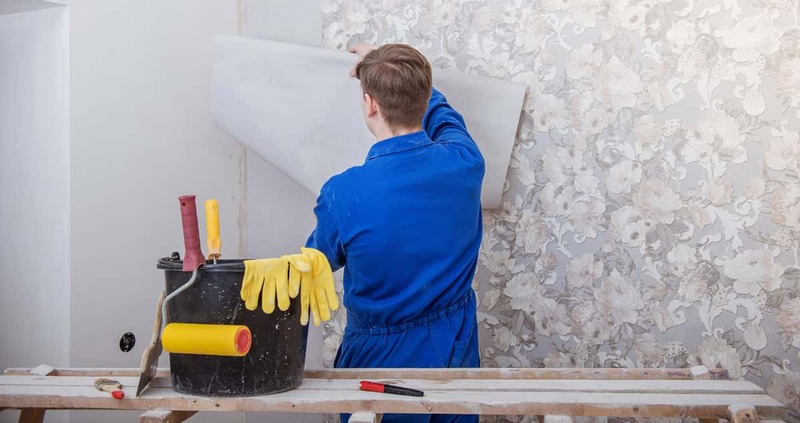 As you finish cleaning a part of the wall, allow it to air dry–do not apply heat—before moving on to the next section. Just like you wouldn’t let red wine sit on your suede sofa overnight, try to avoid letting stains accumulate and soak into your wallpaper. The longer you wait, the harder it is to remove. Spot-clean rogue marks like finger smudges or dark spots around light switches as needed. Consider monthly, or even weekly maintenance to remove scuff marks along baseboards and lower wallpaper sections. Regardless of the wallpaper you own, there are some things you simply shouldn’t do. Always avoid harsh chemicals when cleaning wallpaper. They do everything from alter the color, dissolve paste below the paper, ruin the wallpaper’s outer surface coating, and may even eat away paper itself. Don’t risk ruining your walls for the sake of a scuff mark. As much as you might want to grab steel wool and go to town on some crayon marks, don’t. Your wall cover is delicate. Not only will abrasive tools ruin the texture of the material, but it may also cause the paper to rip. There’s a reason we use wallpaper for the inside of our homes and not the exterior. Even with vinyl wallpaper, too much water is dangerous. Always be sure to use a damp cloth or sponge when cleaning your wallpaper and avoid the seems to avoid your paper from lifting. Chances are, as you’re cleaning your wallpaper, you’re going to see everything, from the scuff marks to the spots your children made their canvas, to bits of wallpaper peeling off. Don’t panic and definitely don’t continue peeling, no matter how satisfying it might be. If while you’re cleaning your wallpaper, you realize it’s a little outdated, you might end up talking yourself into an upgrade. For the trendiest and most tasteful wallpaper and wall art, you’ll want to check out this company. They even have wallpaper from Joanna Gaine’s company, Magnolia. Now that you know exactly how to clean wallpaper based on the type you have, hope you’ve learned not only what to do, but also what to avoid. The next time spring cleaning comes along, why not arm yourself with appliances to help? Truly live like the Jetsons with these time-saving cleaning gadgets.